The Mont des Morios trail moves up the mountain and reveals a 360° view on the river and the mountains of Charlevoix. From afar, the South Shore may be seen. 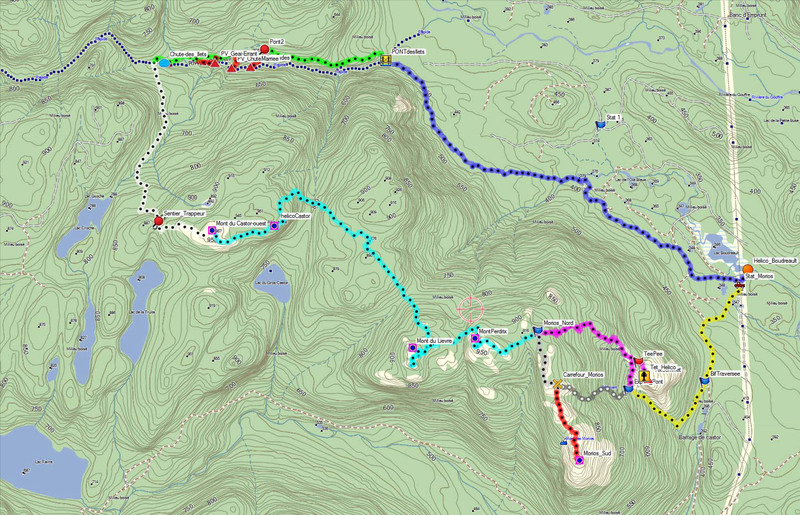 A new section built in 2014 links the Mont des Morios to the la Chute trail and creates a 29 km loop going to the Mont du Gros Castor and down towards Lac Boudreault. From Baie-Saint-Paul, take Route 138 East to Saint-Aimé-des-Lacs. Follow the Rue Principale (« Main Street ») on 9 km to the Lac Brûlé convenience store to pay the access fees. Keep going on the Rue Principale on 1 km and turn left on chemin du Pied-des-Monts. Continue for 14 km and follow indications for the Mont des Morios. The parking lot is located at Lac Boudreault.